The Professional Panther ozone generator is the global leader in its performance class. although the Professional Panther weighs only 6 Kg it produces 7,500 mg of ozone per hour, making it the deodorization solution of choice for a wide range of indoor applications where the goal is the actual destruction of an odor and not its cover-up. The Professional Panther utilizes unique U.S patented double dielectric barrier discharge technology which maximizes ozone output, minimizes maintenance, and maximizes reliability. The Professional Panther complies with UL, FCC and CSA standards. The Professional Panther application process requires removal of people, pets and plants from an enclosed area and operating the Professional Panther for a small period of time, generally less that one hour. 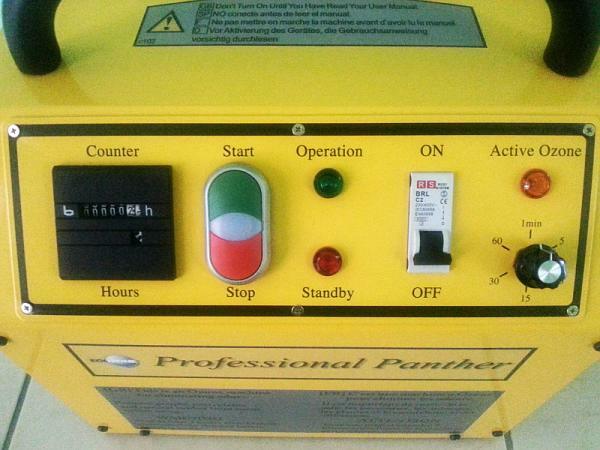 The operating time is selected by using the Professional Panther’s 6-position timer. After treatment, the area may be re-entered after 30 minutes. In addition the Professional Panther allows the user to create repeated ozone applications over a 24 hour period using a Remote Control Key. For instance the user can have the Panther generate ozone for the first 30 min of each hour and continue this treatment for 24 hours. Typical Professional Panther deodorizing applications include fire and flood restoration by eliminating odors from smoke,mold,mildew and sewage. Other applications include use in the home,hotel,farm,motel and car to accomplish destruction of odors from tobacco smoke,urine,body odors,pets and farm animals,mildew,diapers,formaldehyde,garbage and application of new paint and use by commercial establishments to accomplish destruction of odors found in restaurants and associated garbage storage areas,bars,pool halls,beauty shops,dry cleaners,veterinary offices and enclosed dog kennels. Ozone can adversely affect indoor plants, and damage materials such as rubber,electrical wire coatings,and fabrics and art work containing susceptible dyes and pigments ( U.S. EPA,1996a). 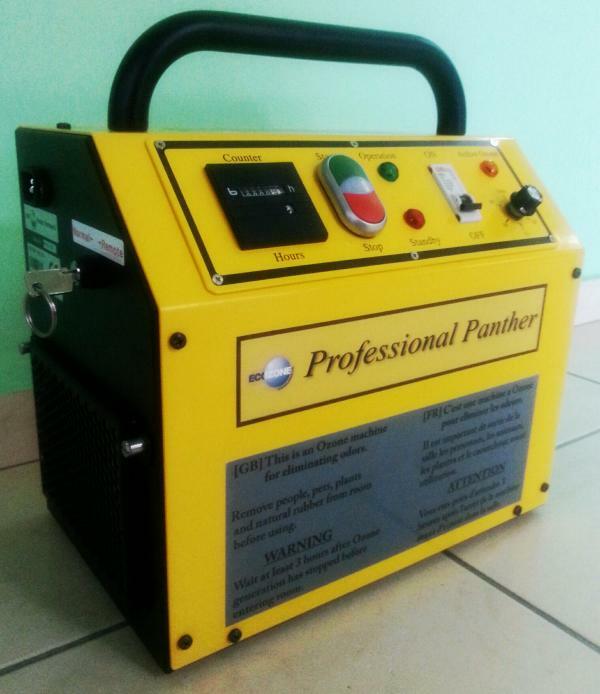 Professional Panther – Generates 7,500 mg/h Ozone. Includes versatile Remote Timing function. Set to any cycle you desire, e.g. : 5 min Ozone every one hour for 24 hours, or whatever cycle is desired. Guaranteed fastest odour removal in its class. Control Panel – Select operating time using 6-position timer.